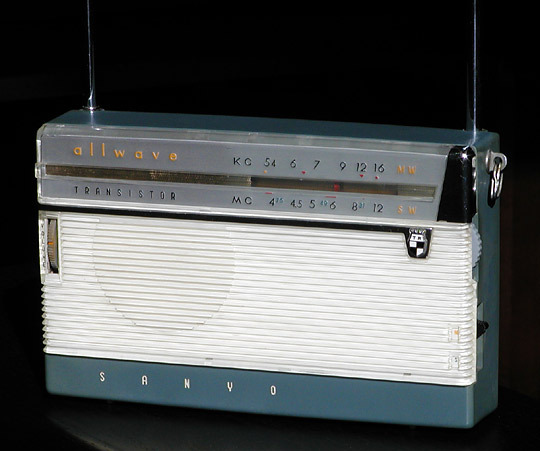 Meet the 7S-P1, Sanyo's first 2-band radio that was released in the late spring of 1958. While not a small radio, it is sleeker than most contemporary 2-band sets the other makers were rushing to release. Sanyo made an effort to give the radio a bunch of flair as can be witnessed in the white reverse-painted grille, the reverse paint upper section in silver, gold and red, the chromed trim elements, and the nifty Sanyo "TR" crest seen on other early models. The 7S-P1 also employed a unique new design with its "extendable frame antenna". The 4-section antenna extends from both sides of the radio to a maximum height of over ten inches (about 260mm) to form a reverse U-shape. The above photo doesn't show the cross-bar section because I couldn't resist posting a separate photo of the radio with its antenna fully extended.